Sage Rountree is an internationally recognized authority in yoga for athletes, an endurance sports coach specializing in athletic recovery, and the co-owner of several wellness businesses. Sage is the author of eight books, including The Athlete’s Guide to Yoga, Racing Wisely, Everyday Yoga, and, most recently, Lifelong Yoga, cowritten with Alexandra DeSiato; Teaching Yoga Beyond the Poses is forthcoming in spring 2019. Sage’s classes, training plans, videos, books, and articles make yoga and healthy living accessible to everyone. Her goal is to help people find the right balance between work and rest for peak performance in sports and in life. With a PhD in English literature and over fifteen years’ experience teaching yoga, Sage is an Experienced Registered Yoga Teacher at the highest level (E-RYT 500) with the Yoga Alliance and sits on the faculty at the Kripalu Center for Yoga and Health. She offers professional development and yoga teacher training courses online at Sage Yoga Teacher Training. Her nationwide workshops include weekends on yoga for athletes; trainings for yoga teachers on working with athletes; and appearances with the Wanderlust Festival, Yoga Journal LIVE!, the Running Summit, and USA Triathlon’s Art and Science of Coaching Symposium. Her students include casual athletes, Olympians, NBA and NFL players, and many University of North Carolina athletes and coaches, including Naismith Hall of Famer and men’s basketball national champion coach Roy Williams, who wrote the foreword to Lifelong Yoga. Sage competes in running races from the 400m to the ultramarathon and triathlons from the super sprint to the Ironman. She has also been an Athleta Featured Athlete (2009) and has been affiliated with prAna as an ambassador and sponsored athlete since 2010. She holds coaching certifications from USA Triathlon and the Road Runners Club of America, and she writes for publications including Runner’s World, Yoga Journal, and USA Triathlon Magazine. A dynamic and popular speaker, Sage presents for USA Triathlon, at the Running Summit, at Wanderlust 108 Mindful Triathlons, at Yoga Journal LIVE! events, and to groups of all ages. Sage has taught in venues as varied as the Pentagon, Prospect Park, and the start line of her local turkey trot. She lives with her husband and daughters in Chapel Hill, NC, where she co-owns several local businesses: the Carolina Yoga Company, with locations in Carrboro, Durham, and Hillsborough, and where she heads the 200- and 500-hour yoga teacher training programs; the Hillsborough Spa and Day Retreat; and the Carolina Massage Institute. Want to book Sage to speak or teach? Download the Workshop Offerings. Media: need a short or long bio, book covers, or high-quality photos? Visit Sage’s media kit folder. Sage’s popular Yoga for Athletes class, Carrboro Yoga Co.
As a competitive athlete, an endurance sports coach, and an experienced yoga teacher, I truly understand exactly how yoga can complement—or be at odds with—training. I know that many athletes are turned off by yoga because it seems too easy (and becomes boring), too hard (and thus painful and intimidating), or out of sync with their training (leading to fears that they’re undermining their hard work). My goal is to create an environment that is easy enough, challenging enough, and can be modified to suit students’ needs. Yoga for athletes isn’t necessarily athletic yoga—the intensity of the yoga must be in inverse proportion to the intensity of the athlete’s training. My work with team sports has taught me that not only should a yoga practice vary according to the sport and time of year, it also depends on the athlete’s position, experience, and abilities. My yoga teaching style uses both flow and long holds focusing on alignment and mindfulness. The flow generates heat, so that the longer holds can work more deeply. My focus in both yoga and training is form and breath: finding the most efficient, economical form and taking the fullest breaths available, in order to stay present even in intense situations. Though I hated the first few yoga classes I attended in 1998—they weren’t lifting weights, they weren’t aerobic exercise, and I didn’t want to admit it, but they were frustratingly hard—while attending prenatal yoga classes, I came to see how yoga enriches other experiences. Taking a class once a week and practicing a little at home as well, I made it through my first marathon without many of the aches and pains that accompany high-mileage running. In 2003, I began teaching while earning my certification. I have also been trained in mat Pilates. I have been inspired by each of my teachers, including Lesa Crocker, Sunny Davis, Paul Grilley, Leslie Kaminoff, Sarah Powers, Erich Schiffmann, and Shiva Rea. In 2010, my business partner Lies Sapp and I took over ownership of the Carrboro Yoga Company, where I’d been teaching since the day the studio opened. Our goal for Carrboro Yoga is to create a space for connection. This can be a connection of body, mind, and spirit; of the individual and the community; of mindfulness with action, thought, and feeling. In September 2012, we opened a sister studio, the Durham Yoga Company, not far from a business my husband co-owns, Rue Cler, a Parisian-style neighborhood restaurant with great beignets. And we have owned the Hillsborough Yoga Company since January 2015. Just above Hillsborough Yoga is our spa, Hillsborough Spa and Day Retreat, a sanctuary for peaceful reflection. And our massage school, the Carolina Massage Institute, is in the same building. Come visit us when you are nearby—we are here to help you find balance and relax! In addition to my coaching certifications, my education includes a PhD in English. Literature gives us insight into the human condition, helping us answer the question of what to make of our existence. Yoga and endurance sports do the same. They teach us how to use our bodies and minds to make sense of our souls. I learn from my training and practice sessions every day. By paying disciplined attention to form and breath during your workouts, you’ll improve your sport performance, as well as your mental focus. I want to help your training and racing become a fulfilling part of your life experience—another way to build strength (in the form of sport skill, speed, and endurance), flexibility (the ability to maintain equanimity on hard days and through stressful situations), and balance (engagement in various healthy, wide-ranging, complementary activities). You’ll gain insight about what to make of your existence. 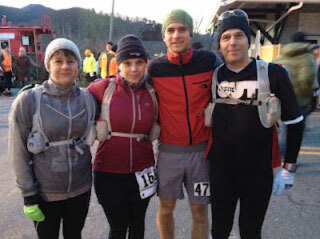 I’ve been a runner for more than twenty years, competing in road and trail races from the 5K to the ultra marathon, and I’ve been a triathlete since 2005. 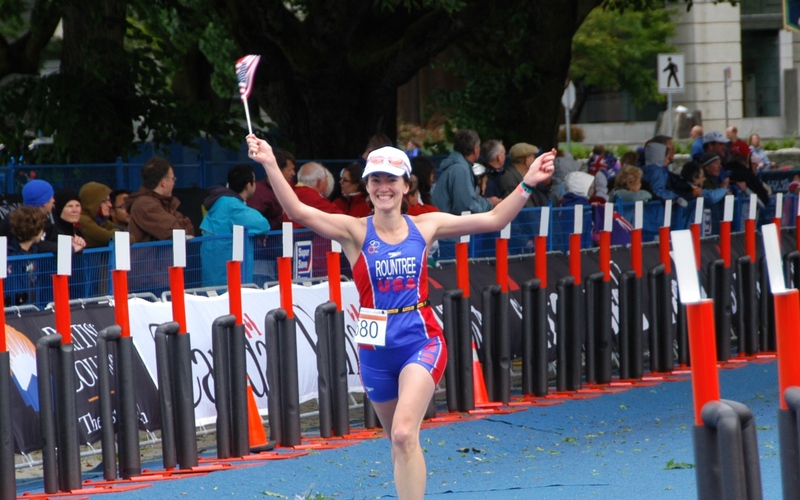 Some highlight races include winning the 2007 Valdese Triathlon, which must be the friendliest race ever; racing in the Short-Course World Triathlon Championships, where I represented Team USA in 2008; loving every minute of Ironman Coeur d’Alene 2009; re-BQing at the Boston Marathon in 2008; and running to and from the 15-degree, 20-mph-windy summit of the highest peak in the eastern United States in the 40-mile 2012 Mount Mitchell Challenge. My favorite races are the ones where I get to connect with the other athletes as we test our limits together. And I always try to finish smiling.